In interior design the Modern Farmhouse look is as diverse as the local area where you find it. Creating an interior space that expresses the atmosphere of a farmhouse starts with exploring your idea of what a Farmhouse looks like and the basic elements that tie it together. American Style Farmhouse - United States Style! The American Farmhouse, for North Americans, usually calls up images of white wood houses with large windows, clean lines, saddle roof and big porches. Inside we each expect for s certain amount of our preconceived ideas for farmhouses to be met. For me it has real wood floors and a large fireplace. It has large, deep porcelain sinks and the door knobs might be porcelain, too. 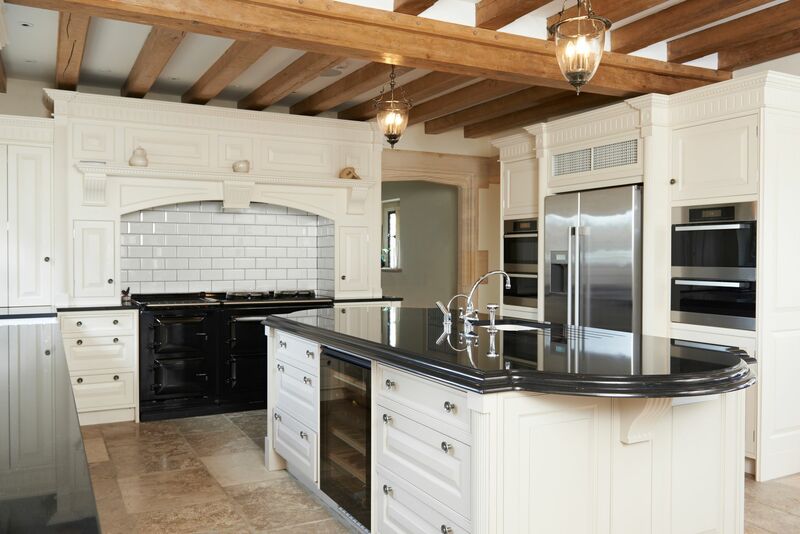 The kitchen cabinets are painted white, in a large well-equipped kitchen. Somewhere in the house is a bear claw tub. When an interior design is successful, the visitor, taking in the totality of these or other expected and satisfactorily found details, transfers fond feelings of the idea over to the house being experienced. It is success. Interior design aiming to attain a modern farmhouse look needs to identify what the idea of a perfect farmhouse interior feels like for the client and what modern 'givens' must over-rule historical facts. For most interpretations of the American Farmhouse Style the general vision of white house, porch and superb genuine wood elements is kept, but the floor plan is opened up. The smaller size of rooms and general lack of clear, open spaces on surfaces is ignored. Today we add space to the small sized rooms historically found in original farmhouses, then fill it with comfortable and warm toned appointments. The increases in natural light in the new floor plan have a dramatic effect on the mood given by the room. Interior design aimed at acquiring this atmosphere and taking it to the next level should pay attention to more luxury oriented details, such as chef's stoves and heated bathroom floors. Today's "Farmhouse in the City" does not seek loyally accurate representations or stark efficient functionality, it seeks to create a space that is warmly inviting and comfortably appointed to handle life's affairs. It has spaces designed around being with other people; family, guests. Britain was building farmhouses long before Europeans came to America. Unlike our wood framed houses, the average (not all!) English farmer's house is stone and squarish. The rooms are small, to make heating them possible with the methods available to pre-electricity society in many cases. The modern English Farmhouse strips off the vines and lights up the exterior. It scrubs the ancient and very dirty stones to reveal character hidden beneath the years build up. More glass windows and additions such as sunroom or atriums are added, while interior walls are torn down to get open clean space and light. While the original British farmhouse was a bit crowded, the modern one goes for more minimalism when budgets allow. The English, more sentimental than their demeanor lets on, will find ancient gems and integrate them into their modern interior design. 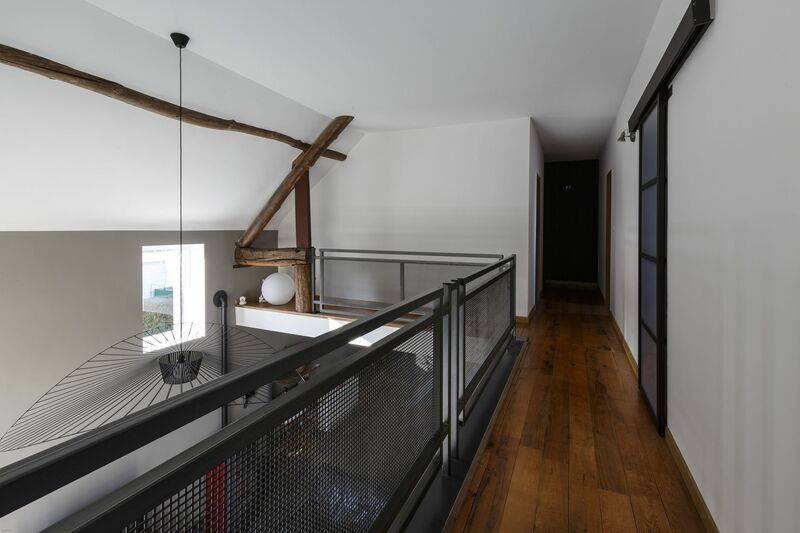 Tell a French Real Estate Agent that you want a country farmhouse and you might be shown some (previous) barns that hide away super modern contemporary interiors. Nothing of the old charm remains for those seeking to rekindle a link to another time and way of life. Well, the structure's exterior shell is there to confuse you. If you do seek to stay in houses where the owners preserved an older period look, you find luxurious furniture in houses that pay homage to the beauty of wood elements. As far as how to mimic either, you'll need a French designer's help. 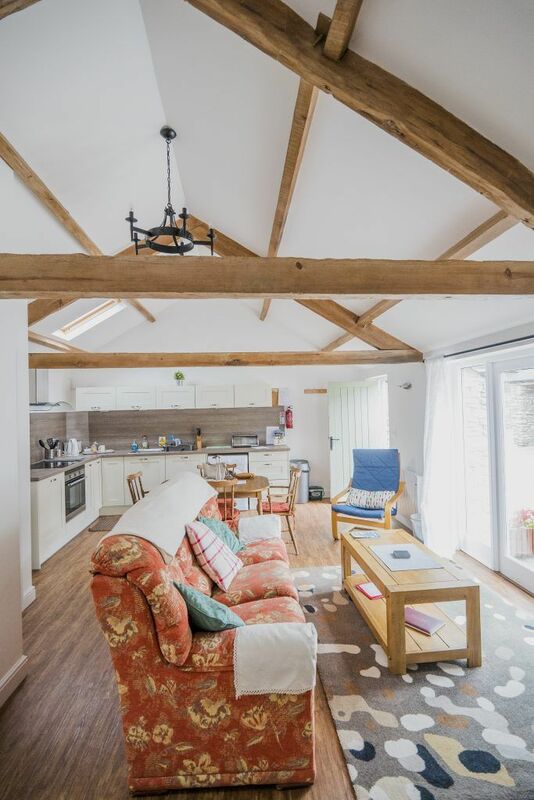 By the way, the English are turning old stone barns into fabulous homes, too! 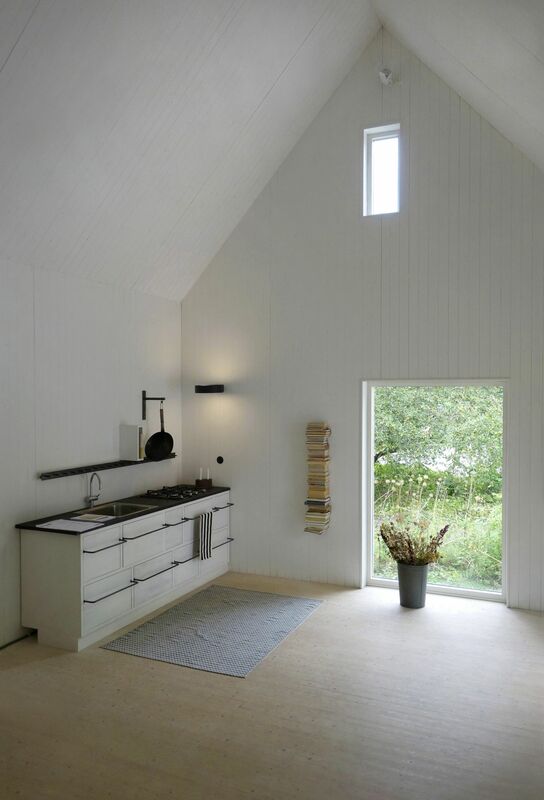 Scandinavian Farmhouses have white interiors. There, we got the most obvious observation possible. I mean a lot of white. Personally I feel it is a different use of white than the American counterpart, one nearly opposite the higher end you go. The American white looks down to earth and simple. It feels inviting and warm. The Scandinavian Farmhouse uses white to intensify brightness and give the room a powerfully clean and uncluttered look. When I see a high-end scandinavian professionally designed home, I just look at it and imagine knocking over a glass of wine as I accidentally drop and step on a caramel filled chocolate. Many of this country's modern farmhouse style uses wood elements, but does not shy away from metal or from contemporary minimalist chairs. Geometrical, almost 'polished industrial' decorations are common. The renovations to add more windows and glass tend to be more enthusiastic than done in England. This makes open minimalist spaces even more open feeling. Flat, geometrical simple lines in open floor plans featuring an over abundance is the overall presentation. While this is obviously not a look I can get enthusiastic about, it is exactly what the owners of the farmhouses love, and so will many of you. It isn't a hard look to attain after you've seen enough images. Clean, flat, dominated by one or two colors, and undeniably modern is only hard to keep day to day. If going for this design be sure to plan what each area needs in storage. Keep a drawer table stand or similar piece of furniture in areas that clutter might naturally collect.